Geoffrey Tibble (1909-1952). There is nothing fussy or over-worked in Geoffrey Tibble's painting. In common with so much of that of his generation, his work looks to the domestic impressionism of late 19th century Paris, to Degas in particular, and its subsequent followers in France and elsewhere. 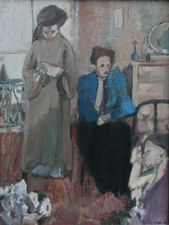 It looks to to Vuillard and Sickert and the painters of Camden Town and Bloomsbury, all moderated by the qualities of the English light and sensibility. The handling is loose but not over-free, the drawings sure and simple, the paint fat but not thick and dense. The colour is muted, the tone moderate. Tibble studied at the Slade School under Henry Tonks, where his contemporaries were Coldstream, Carr, Townsend and Bellingham-Smith. In 1934, he exhibited abstracts works at the Objective Abstract Exhibition at the Zwemmer Gallery and between 1933 and 1935 represented with Moynihan, Bell, and Hubert, the most radical of the objective abstractionists. In 1937 he returned to figurative painting, and works such as Gina, Afternoon reflect his interest in Japanese colour prints in its arrangement of colour. Tibble had his first solo exhibition at Tooths Gallery in 1946, and subsequently exhibited at leading London galleries, including the Leicester and Lefevre Galleries at the London Group, and became a member in 1944 at the NEAC and in group exhibitions. 1. William Packer, Geoffrey Tibble, Wives and Daughters, November-December 2002, Jonathan Clark Fine Art.